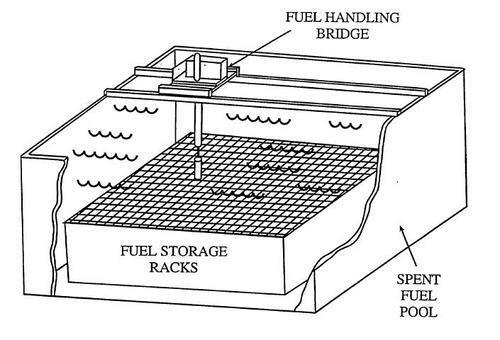 On June 1, 1982, a diver installing support plates for fuel storage racks in the Unit 2 spent fuel pool (see figure above for a representative spent fuel pool) at Indian Point in New York received a radiation exposure of about 8.7 rem to his head. Federal limits restrict radiation exposure for workers to 5 rem per year. This diver received more than a year’s allotment of radiation in a few minutes. Prior to the diver entering the water, an irradiated fuel assembly was mistakenly transferred to a location a few feet away from where the diver would be working. A poor-quality copy of the fuel transfer procedures contributed to the fuel assembly ending up in the wrong location. Cloudy water in the pool compounded by a lack of underwater lighting in the pool prevented workers from detecting the misplaced fuel assembly. Another barrier intended to protect the diver also failed. The radiation survey of the pool performed before the diver entered the pool failed to detect the misplaced fuel assembly’s radiation field of several hundred rem per hour near the diver’s work area. The output from the radiation detector had exhibited erratic behavior during previous dives. The licensee attributed the radiation detector’s high readings to a buildup of moisture in the underwater detector’s housing. The diver swam to the work location near the highly radioactive fuel assembly. He began feeling dizzy and nauseous. He backed away from the work location and returned to the pool’s surface. An ensuing investigation found the mislocated fuel assembly and the diver’s radiation overexposure. At least three barriers intended to protect the diver failed in this event. First, an irradiated fuel assembly was improperly placed close to the work area. Second, visual checks failed to discern the error. And third, high radiation levels in the work area were dismissed as anomalies. Radiological controls at nuclear power plants are intended to prevent workers from getting too much radiation exposure. Allowing people to work until they get radiation sickness is less than adequate radiological controls.